Who uses the Truckee River? 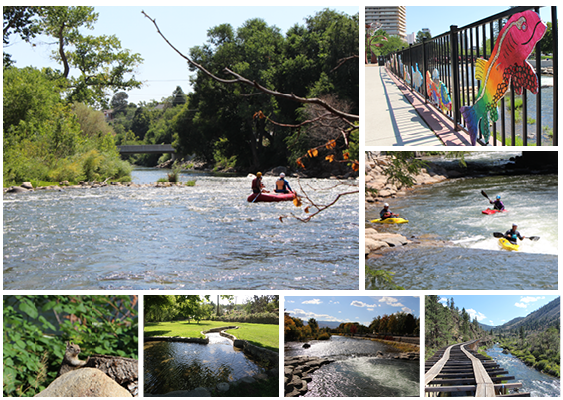 The Truckee River system is used by several communities and for many purposes. The Truckee River winds down from pristine Lake Tahoe on a 100-mile route through Sierra mountain canyons, past the communities of Reno and Sparks, and finally carves through the high desert into Pyramid Lake. The River is the lifeblood of the Truckee Meadows, supplying 85 percent of the water used in homes and businesses. But, the Truckee River water is also used by other communities and for many other purposes. What other communities use Truckee River water? In addition to the Truckee Meadows population, we share this precious resource with the towns of Truckee in California and Fernley to our east in Nevada. As in the Truckee Meadows, water is used in these communities by homes and businesses. Are there other users of the Truckee? Yes, several. The Truckee-Carson Irrigation District (TCID) has a right to water from the River through its priority and diversion at Derby Dam. Currently TCID diverts approximately one-third of the river flow at the Derby Dam to the Lahontan Valley for agricultural irrigation. Another large user of the Truckee River is the U.S. Fish and Wildlife Service, which releases water accumulated in Stampede and Prosser Reservoirs to induce spawning of the endangered cui-ui and Lahontan cut-throat trout. Also, many dams and at least three hydroelectric plants divert and return water along the way for electric generation in the Truckee Meadows. And not to be forgotten is Pyramid Lake, itself, where the River ends. A certain level of river water is required to flow into the lake. Besides use for homes, businesses, agriculture, and fish, are there other river uses? Drought reserves are stored upstream for our use during periods of low river flows. And, let’s not forget about recreation. From Lake Tahoe to Pyramid Lake, recreationalists such as bikers, hikers, swimmers, rafters, picnickers, paddlers, boaters, fishermen and nature-lovers flock to the Truckee River year-round. Who decides how much water is used and for what purpose? In a normal year, Reno and Sparks diverts and uses only about six percent of the Truckee River’s total volume and, of that, about half is returned to the River through the sewage treatment plant for other water users downstream. When precipitation is low or when a drought is indicated, less water flows into Pyramid Lake and municipal and irrigation diversions change.